Christmas Eve – “Christmas Kisses” Rare Vinyl and More…..
Take his holiday release “The Christmas Song (Chestnuts Roasting on an Open Fire)“. For those completists among us you’d think it’d be a simple thing to secure a copy for your collection. It’s just one song after all – done in the same crooner style and the light jazz instrumentation of Kisses on the Bottom, Paul’s LP from earlier in the year. Thanks to Andrey in Russia for sending through these scans. He got them from a mate in Germany who ordered the single from two different sources and was lucky to get one copy of each colour. Apparently one of his friends in the USA ordered five copies but got all of them in the red colour. Another collector in Japan ordered four copies and got all of them in the green….As the covers are all sealed in heat-shrink plastic nobody knows what colour vinyl will arrive until they open them. And, given it’s limited release status, the single has been for sale on Ebay at very inflated prices…..
You’d think that would be the end of it. But no. There are two different versions of Paul McCartney’s rendition of “The Christmas Song” (and thanks to the WogBlog site for this information). One version comes with strings and is only available as a bonus track on the digital download album called Complete Kisses. This is an iTunes exclusive, digital-only album released in conjunction with the DVD/BlueRay of Paul performing all the songs from Kisses on the Bottom live. However, the song on the vinyl singles above and on the Holidays Rule CD are without the strings, just Paul singing backed by a small jazz ensemble. 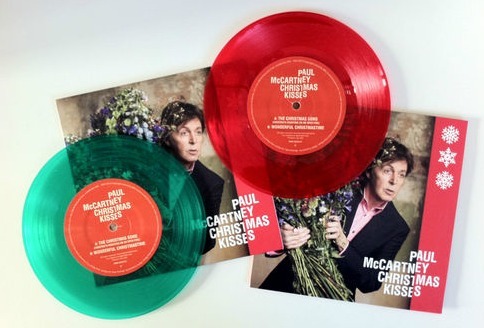 So, if you want every version of just this one McCartney song you have to hunt around – and reach deep into your wallet – this Christmas. Happy Christmas, happy collecting, and happy holidays everyone. This entry was posted in Beatles, Beatles Collecting, Beatles Music, Beatles Related, Paul McCartney and tagged Beatles, Beatles Collecting, Beatles Related, Christmas Kisses, Kisses on the Bottom, Paul McCartney, The Christmas Song by beatlesblogger. Bookmark the permalink. Just shine a bright flashlight through the sealed picture sleeve, and you can easily see the color of the vinyl record inside.